This site has moved to AskAManager.org, please update your bookmarks. If you were looking for a specific post, you can use the site search option, archives, or categories at the new domain to find it. Thank you! 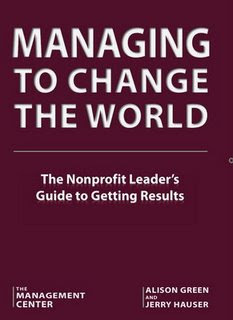 I'm the co-author of Managing to Change the World: The Nonprofit Leader's Guide to Getting Results. If you want all my thoughts on how to be a good manager, this book is it. The book is geared toward nonprofit managers because that's what my co-author, Jerry Hauser (former COO of Teach For America and current head of The Management Center), and I care about most -- we want to see more nonprofits being effective instead of just well-intentioned. But there's little in here that I wouldn't recommend to any manager. Our goal was to create an easy-to-use manual that would help managers get better results by equipping them with hands-on, practical advice, covering what we think are the most important areas for managers to master -- from delegating tasks, to setting and holding people accountable to clear goals, to hiring and firing, to staying organized and using your time effectively, to managing your boss. We also included a bunch of tools, like sample scripts for conducting performance coaching or a firing. You can buy Managing to Change the World here. Tell your nonprofit-y friends! 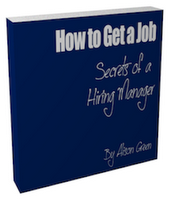 Buy it anonymously for your incompetent manager! am I being exploited as a volunteer? don't call to "schedule an interview"
Interviewed for a job and never heard back? Politely set them straight about courteous behavior at EmailYourInterviewer.com.